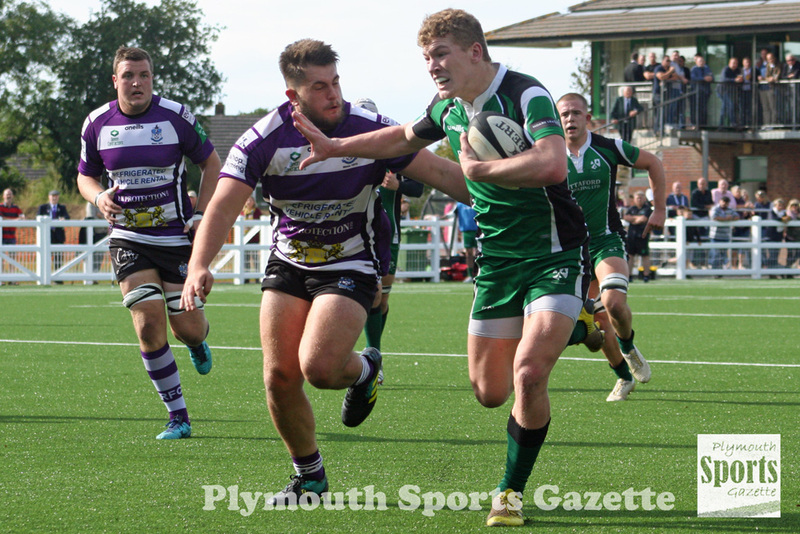 IVYBRIDGE came from 14-3 down to secure a 41-31 home victory over Devon rivals Exmouth in South West Premier on Saturday and extend their winning start to the season. The Bridgers have now won their opening five games and they and leaders Bournemouth are three points clear of anyone else in the table. The South Hams club, though, did have to dig really deep in the first half at Cross-in-Hand as Exmouth, who arrived in fourth spot, threw everything at them. The visitors went 11 points up and were still leading at the break, but Ivybridge, whose scrum was outstanding, scored four tries in a 12-minute spell early in the second half to put themselves into a commanding position. “We gave Exmouth an easy start really,” said coach Jamie Tripcony. “And, fair play to them, they took their chances in the first 20 minutes and we were under the cosh. “But credit to our guys they showed great character to come back into the game. “Our scrum was big again and our backs made sure we played in the right areas second half. Ivybridge scored a try and a penalty late in the first half and Tripcony felt those were crucial to the outcome of the game. “Like I said, we were under the cosh there in that first 20 minutes. Things were not quite going our way; sometimes in rugby that happens and for the guys to bounce back was tough. Defences were definitely on top in the first period and at half-time you would not have imagined the game would end with nine tries and a total of 72 points. Billy Pinkus, who finished with a 100 per cent kicking rate, put Ivybridge ahead with a long-range penalty on eight minutes. But by the 29th minute the hosts were 14-3 down and had hardly been in Exmouth’s half. The visitors took the lead in the 10th minute when number eight Dave Bargent scored in the left corner after some great quick play by Exmouth. Tom Whelan added the conversion. Exmouth had a lot of ball but for most of the time they just went from side-to-side without making any ground due to Ivybridge’s defence. But on 29 minutes, Ivybridge missed a tackle high up field and Exmouth attacked quickly and Jack Downie scored and Whelan converted. But almost straight from the restart, Ivybridge got back into the game when young centre Will Lamont scored a fine try in the left corner, which Pinkus brilliantly converted. He also kicked a penalty six minutes later to put his side within a point. Exmouth had a man sin-binned just before the interval, but they increased their lead after the break with a Whelan penalty. But suddenly Ivybridge came to life thanks to their impressive pack. They pushed Exmouth off a scrum close to the line and got three penalties. On each occasion they opted for another scrum before they were finally awarded a penalty try to go 20-17 in front. Straight from the restart they scored again when a good chip to the corner was dived on by Billy Pinkus, who again brilliantly converted. Five minutes later they scored their fourth when Ben Watts put a chip kick in and won the race to collect it before off-loading to captain Charlie Briant, who ran in under the posts. Sam Whitehead did stop the flow with a try on the left for Exmouth, which George Meadows converted, but Ivybridge were not done and player-coach Lewis Paterson broke down the left wing and scored in the corner. Pinkus again converted. 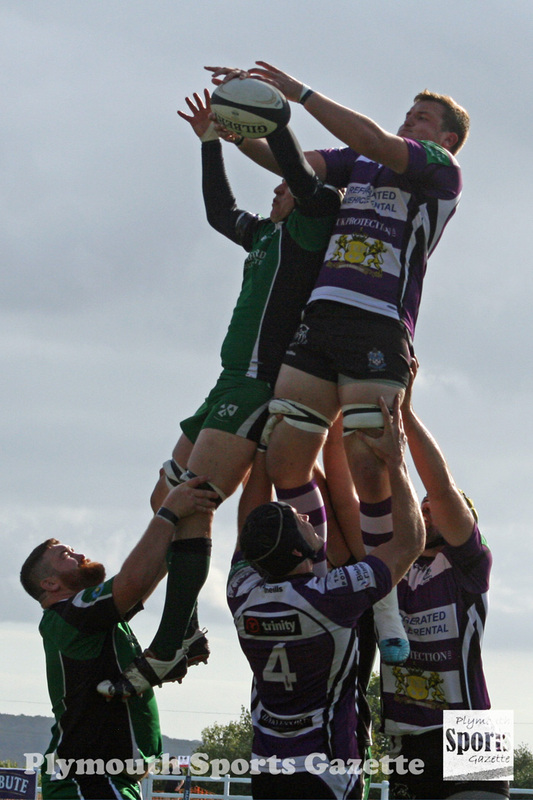 Exmouth did pile on the pressure in the last 10 minutes which led to Ivybridge being reduced to 14 men. But the hosts defended well with a man less and it was not until the sixth minute of added-on time that Exmouth finally got their fourth try when Jack Fahy touched down next to the posts from close range. DEVONPORT Services’ three-match winning run came to an end when they were beaten 36-31 away at Hornets. However, Services did pick up two bonus points from their trip to Somerset to leave them seventh in a tight South West One table. “We got two bonus points as we scored five tries and were within seven,” said head coach Mike Lewis. But Lewis was frustrated his team were not returning with five points. The visitors were unhappy with a few decisions that did not go their way against a team that had previously been in the South West Premier. He added: “We didn’t get off the bus for the first 20 minutes of the game, which was unfortunate. They went three tries up pretty early on. “They are a big old side – a lot bigger than us in every position across the field. Our biggest player was about the same size as their scrum-half – or it seems like that anyway. Services, having gone three tries behind, did go 29-26 in front, with their pack impressing, before finding themselves 36-26 down late on the game before Matt Gregory put them within a score. Gregory was the only forward to score for Services, with their other tries coming from Callum Perkins, Toby Knowles, Rhys Williams and Luke Kenny. In Western Counties West, Saltash also picked up two losing bonus points in a narrow 37-32 defeat at Wadebridge Camels. Those two points have lifted the Ashes off the foot of the table and will have given them a big boost with some winnable games coming up. The Ashes certainly found their try-scoring form again, although unfortunately could not quite find a way to stop conceding them. After going 7-0 down they responded and went 12-10 up thanks to a first try in Saltash colours for former Oaks winger Joe Rider, who touched down in the right corner, and one for fellow back Ryan Cruickshanks. But the Ashes suffered a blow in the final 20 minutes of the first half by conceding 15 points to trail 25-12 at half-time. Wadebridge went 30-12 ahead before Saltash mounted a fight-back. Down kicked a penalty before number eight Steve Hillman scored a try, which Down converted. Down then kicked another penalty to leave the Ashes just five points behind. The Camels eased their worries with a try 10 minutes from time, but Saltash were not done and they bagged a fourth try and a losing bonus point with a touch-down from prop Si Nance. Wadebridge’s tries came from Adam Blackmore (2), Joe Pretty, Dom Hawkey and Will Pengelly, with Danny Thomas kicking the rest of their points. LEAGUE leaders Plymstock Albion Oaks held off a late challenge by South Molton to win 21-17 at Unicorn Park and make it five wins in a row. Debutant fly-half Al Murray, who moved to Oaks from city rivals Plymouth Argaum during the week, had a dream debut for his new club by scoring 16 points. 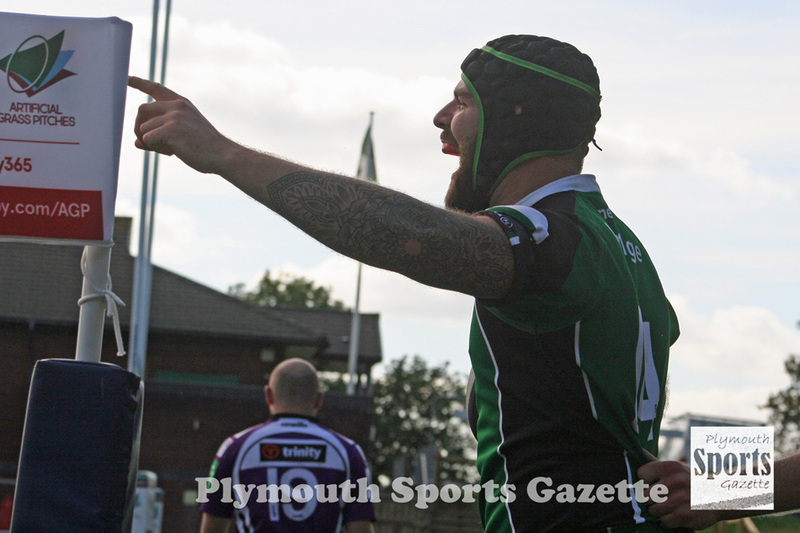 Murray kicked nine points in the first half as Plymstock made sure they took any points on offer to take a 14-3 half-time lead. Winger Joe Brierley scored the only try in the opening 40 minutes when the visitors went wide after some good mauling. South Molton’s only points in the first period came from a Callum Stone penalty. Murray then scored an interception try after the interval to edge Plymstock further ahead, but then the hosts came to life. Dan Smith went over for a converted try to close the gap, before Reece Eury crossed three minutes from time to put his side within one score. South Molton finished the game attacking Oaks’ line but the visitors were able to hold out, much to the delight of player-coach Aiden Taylor. “It was a very tight game,” said Taylor. “They (South Molton) are a very good team. “In the first half we kicked a few points. Al Murray was excellent, he scored 16 points for us. “But they (South Molton) made a late comeback. They scored their first try in the last 10 minutes and then they scored in the last three minutes to give us a real scare, but we managed to grind out a result against a very big, physical forward pack. Tavistock finally secured their first win of the season and ended their poor record against their neighbours Plymouth Argaum. Argaum had won the last six league meetings between the teams, but injury-hit Tavistock showed tremendous spirit and determination to pick up a full five points this time around. “To win against Argaum, get a bonus point and stop them getting one was huge,” said Tavistock’s Hammy Kerswill. The hosts got off to a great start and led 19-0 after 30 minutes. Prop Jason Ward, playing his first league game in years, got them off the mark with a try from close range, which youngster Ed Nettleship converted. Sam Eaton then scored with a good counterattack move to make it 12-0, before Nettleship added an interception try from deep in his own half, which he also converted. Argaum did get a try back just before half-time courtesy of Jack Franklin, which Mike Hunt, playing his first game at fly-half, converted. Hunt, who has played lock, back-row and centre for Argaum, then closed the gap to five points after the break with a try and conversion. But Tavistock sealed the win with a Tom Charlesworth try and a late penalty by teenager Nettleship. Argaum secretary Stuart Quarterman said: “We didn’t play well. We won our line-outs and our own scrums and put pressure on theirs, but elsewhere the ball was not sticking to our hands. Nothing we were trying was working. OPMs got their first win back in Devon One with a narrow 19-13 victory over their city rivals Old Techs. The last five meetings between the clubs have all been decided by one score and this again went down to the wire. OPMs took a 10-0 half-time lead with a try from Matt Thompson and a stunning individual effort from Martin Skelly. But, in a stop-start game, Techs closed the gap to 10-7 after the break with a try by Eddie Ramazani, which Joel Dicken converted. The hosts thought they had scored another try in the second half, but it was disallowed, and in the end the game came down to penalty kicks, with Skelly kicking two and Thompson one for OPMs and Dicken putting two over for Techs. “We are happy, very happy,” said OPMs captain Billy Garratt afterwards. Techs’ Sean Bedford-Smith said: “Obviously it was disappointing. It was always going to be close. “They (OPMs) scored early and in the first half they did quite well. But second half we came back and got our shape going quite well. “We had a try initially given but then disallowed afterwards. We were all a little bit confused by that and that would have put us ahead. Tamar Saracens took positives from their performance against unbeaten North Tawton on Saturday. Although Sarries lost 33-21 at Parkway, it was only in the closing stages that North Tawton pulled away. The hosts were leading 14-7 at half-time and were still in the game until an interception try turned the game. Scrum-half Tom Rigby scored twice for Sarries, who had Adam Colbert also crossing and youngster Lewis Swatton converting all of them. North Tawton’s tries came from Luke Dennis, Craig Dennis, James Bowden, Si Quick and Gary Sizmur, who kicked the rest of their points. “It was one of those games where we were left really frustrated,” said Sarries spokesman Marc Cioffi. “The game was ours for the taking. We were in the lead into the 60-minute mark, but a couple of silly little mistakes cost us a couple of tries. In the Devon Merit Table, Plympton Victoria were the latest team to experience the strength of Kingsbridge II. 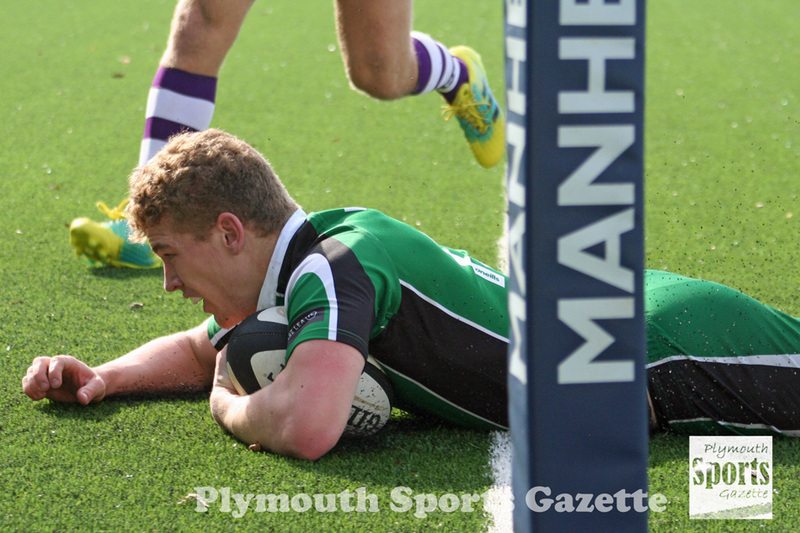 The South Hams club had beaten DHSOB 89-0 and on Saturday they beat Plym Vic 89-5. Plym Vic had to start the game with just 14 players after some late drop-out and then suffered an injury during the match and so had to play with less men than their more experienced hosts. However, team manager Chris Hunt, who did play, said there were plenty of positives for the club, who scored through Sam Wilmington. “The lads said they enjoyed the game but the result was a bit inevitable,” said Hunt. “We did score a try and had another disallowed and we also squandered at least six points in penalties. “We went out there with certain goals – one was to make sure we weren’t nilled. And we could have got have got into mid-double figures if we had kicked our penalties and that try had been given. “We did get some points on the board and we did go out and enjoy the game. Our defence, believe it or not, was pretty good. They had one or two extra man and they were good enough to go wide and exploit that. “They (Kingsbridge) are undoubtedly a strong side. They have a mixture of guys who are second team players, a few youngsters who are being reared for the first team and also some guys in the second team looking to get into the first team. They are doing well and you can tell they practice against live bodies as well. Their scrum was really well-drilled. That will start this coming Saturday when they host DHSOB at King George V Playing Fields.